I walked into the classroom, sat down and stared at the other 20 people. The first thing I noticed was I was that almost everyone was older than me. There were about 3 of us that appeared to be early to mid-thirties, everyone else was 20-30 years older. Next, I noticed that about 5 of the people were Black. Some people looked rich, some looked poor, some looked happy, and others looked stressed. Do I belong here? Can I quit this class without being harassed via email? I hope I don’t fall asleep. These were the thoughts in my head as I sat waiting for the class to begin. Two hours later and several tear drops later all I saw were people who understood my struggle for the last 25 years. What did I have in common with these people? Shame. Hurt. Anger. Confusion. These feelings are what I had in common with them. We all agreed to meet in that classroom every Sunday for three hours to learn how to deal with the shame, hurt, anger and confusion. How is that a room full of people of various ages, races, and from different places across the state agreed to meet every Sunday at the same time and at the same place for 3-months? Well, one other thing we had in common was the reason we feelings of shame, hurt, anger and confusion. That reason was we all had a loved one that had been diagnosed with a mental illness. Let me be clear, it wasn’t the loved one or the fact that they had been diagnosed with an illness. It was the fact that we lacked mental health awareness and mental illness awareness education. It was the fact that unlike cancer diagnosis, strokes patients, or when severe physical injuries occur no one tells us how to properly care for our loved ones. It was the fact that the stigma of mental illness in our society prevented us from telling others and seeking support for ourselves. The people in that room, including myself, never learned how to separate the illness from our loved one. We never learned that the illness isn’t something that we could have prevented if we had been better parents, siblings, children. We never learned that while we were figuring out how to keep our loved ones alive, safe and healthy, that we had to take care of ourselves first. At the end of the three months, I no longer saw the differences in that room, I saw them as sources of support for the difficult days. I no longer wondered if I belonged; I wondered who else belonged in this class. I wished I had taken the class years ago because I had no idea that the parents, whose 17-year old son had been diagnosed with bipolar, would share the same feelings of shame, because of the stigma your loved one will have to deal with. I would have never guessed that that retired single mother whose adult son was diagnosed with Manic Depressive Disorder, would understand the hurt when you have seen a loved one suffering and you don’t know how to help. I was surprised to hear the anger and confusion one father had towards his 20-something-year-old daughter for not taking her meds, but the more I heard of his story the more I saw my mother and grandfather. The more stories we all heard, the more education we received, the more we talked about ways to help and cope, the less we felt the shame, hurt, anger and confusion. I was able to hear 20 different personal experiences in NAMI’s Family to Family Class. Hearing those experiences are the reason why Speak Away the Stigma exist today. I truly believe that if I had known that I wasn’t alone, my feelings of shame, hurt, anger and confusion may not have controlled my life for so many years. 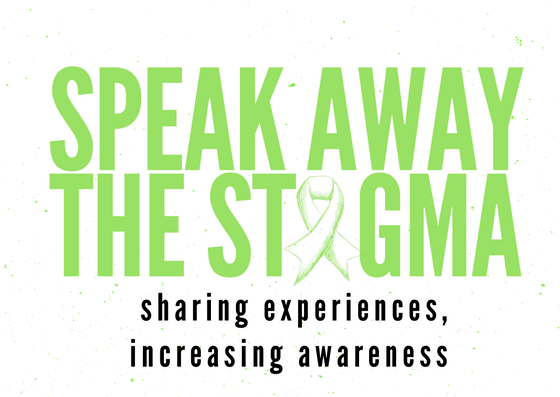 Speak Away the Stigma is a platform that will share stories of those that have been diagnosed with a mental illness and those that love someone with a mental illness. Let’s share stories. Let educate. Let’s speak away the stigma. Previous Previous post: 11 Things that made us talk Mental Health in 2016!